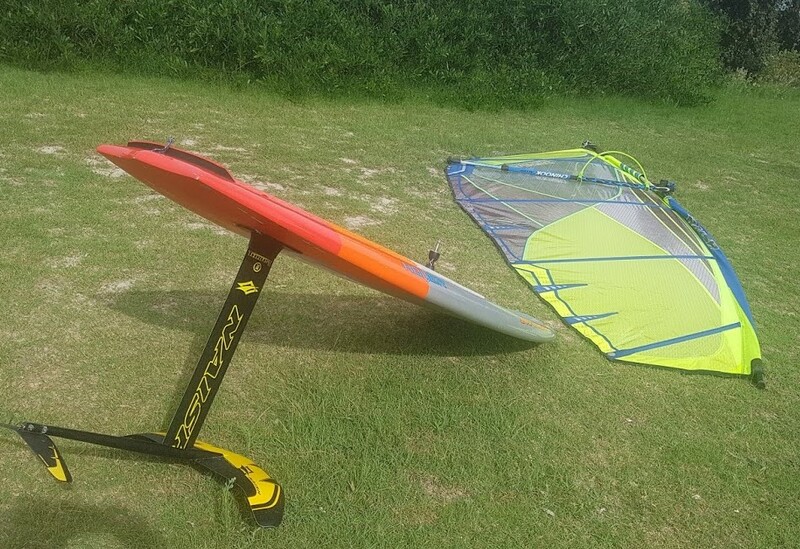 Back in February I upgraded to a Naish Hover board - back to the future? Yes, I should have mentioned it earlier. I have been doing both from the middle position, mostly without much success. They say "this board is a great choice for beginner foilers, while those more experienced can position the foil further back for greater manoeuvrability." So maybe I was right to have it in the middle position, the last thing I need at the moment is "greater manoeuvrability". I am using it with the 5.4 sq metre sail in the picture above and a 4.2 sq metre sail called a Chopper. 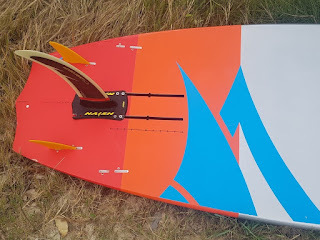 Instead of the quad fins that came with the board I am using the following fin setup to sailboard without the foil. Look closely and see how having four bolts in the front of the plate allows me to have the fin further back than the US boxes would otherwise allow. Did I mention that I am very close to getting this working for me? All I have to do with the Windfoiling is unlearn 40 years of sailboarding and sheet on, not off when I come up on the foil. All I have to do with the SUPing is get to my feet from the kneeling position before the board comes up on the foil. Had some fun rides staying on my knees but I want to "take this to the next level". Alex Mauer goes all-out in learning to surf a SUP foil and tells his story to Standup Journal. ..surfed wave after wave until my legs were jelly. Over the rest of the trip, I found my share of wipeouts and revelled in my share of “flight” time. I learned, with practice, that the easiest way to get out to the line up is to wade the board, foil pointed up, until in chest deep water. Once chest deep, flip the foil into the water, jump onto the board and paddle over the waves to the line up. Tutorials: Videos showing how to get started for beginners, improving techniques for moderate foilers, and for the more advanced there are opportunities to see new tricks. Blog: News, interviews, tutorials, reviews. Their selection of products from trusted brands. A week or two ago I had another tow behind a boat to get and idea of what to do when on the foil and the board starts to feel very vague. Today's Saturday had south wind, quite gusty and it had been blowing for days. We do not have anywhere that you can sail smooth water in those conditions. There was a bit of a stuff-up with recording this session on my watch but the foiling bit was the bottom of the two lines. I was not going flat out, just easing it up gently and getting some airtime before the next bit of chop hit the board. Recovering from these splashes - it was good practice to do that, but very draining. 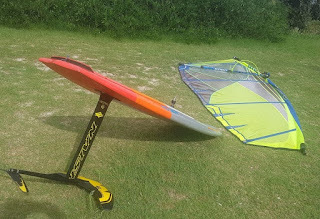 In the end I gained some confidence that I can now windfoil, I know where the feet go on the board (I ride without straps - relying on rubber booties on a rubber deck). That said I am aware that I need more practice in smooth surface conditions. The NE wind does allow this at a spot just north of where I sailed today. At the moment it looks like the combination of windfoiling and riding waves is way beyond me. Maybe a Gerroa session would fix that. Slowly getting there. 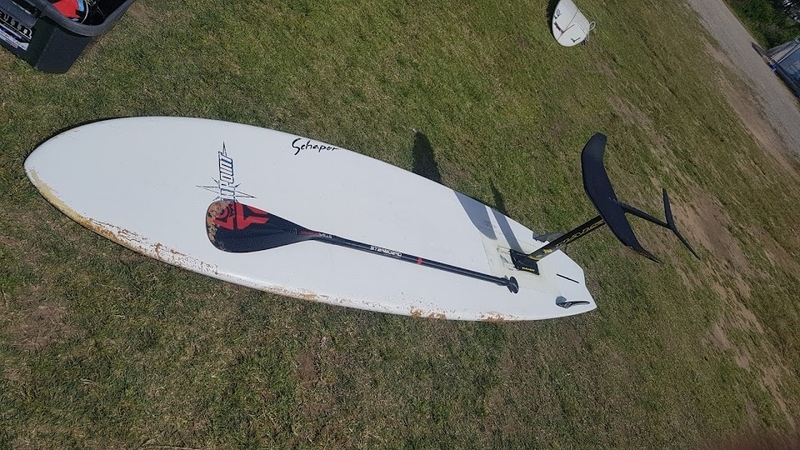 Wind was enough to get the foil flying in the water without lifting the board clear of the surface. If at first you don't succeed - buy more gear. Here is a photo of another board that I converted to having a foil. Southpoint Bonga Perkins design 9'5" by about 28" wide, wide point forward. All this stuff at the bottom is a record of riding it for the first time, SUP foil style (on-the-knees to take off). 10 waves in 2 hours was a reflection of the long period of parts of the small swell. I so want to do this by November 2018 or February 2019 at the latest..